As a home cook, nothing beats having the family gather around the kitchen table to enjoy a delicious home-cooked meal. 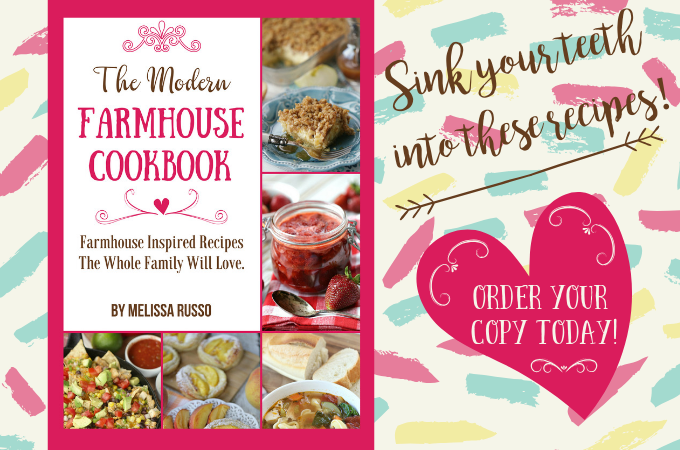 The Modern Farmhouse Cookbook by Melissa Russo offers a delicious mix of recipes that will please the entire family. This collection of farm to table recipes are favorites of this busy farm wife, mom, blogger and food lover. Most of these recipes incorporates the homegrown goodness of the seasonal produce grown on her family's large fruit and vegetable farm. The Modern Farmhouse Cookbook includes 25 down home recipes from breakfast, lunch, and dinner to appetizers and mouthwatering desserts such as: • Cinnamon Sugar Pumpkin Waffles • Easy Beef Stir Fry • Peach Breakfast Danish • Sheet Cake Brownies • Strawberry Peach Wine Slush • Southwestern Skillet Nachos Pull a chair up, have a seat and enjoy the mouthwatering farm to table recipes in this cookbook. As a home cook, nothing beats having the family gather around the kitchen table to enjoy a delicious home-cooked meal. The Modern Farmhouse Cookbook by Melissa Russo offers a delicious mix of recipes that will please the entire family. This collection of farm to table recipes are favorites of this busy farm wife, mom, blogger and food lover. Most of these recipes incorporates the homegrown goodness of the seasonal produce grown on her family's large fruit and vegetable farm. Pull a chair up, have a seat and enjoy the mouthwatering farm to table recipes in this cookbook.